Cooped up with your newborn and sick of the sight of your own four walls? Looking for something to do, but don’t know where to begin? 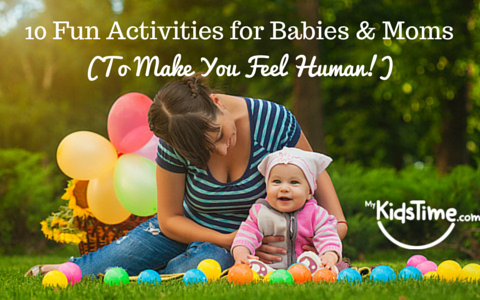 Here’s 10 Fun Activities for Babies & Moms, from movies to museums, all guaranteed to make you feel human again! One of my favourite activities is going to the movies with my son. The movies? Yes. With an infant? Oh yeah! I thought my movie going days were over after having a newborn. I wasn’t expecting to go to the movies unless I got a babysitter, or until he was old enough to ask to go see the latest Disney movie. To my great and unexpected surprise, there are several theatres nearby that have Mommy & Me movie times. Midmorning every Monday, in my local cinema, they accommodate babies at the theatre by turning the lights up so it’s not pitch black, and the sound is turned down for baby’s tiny ears. They have stroller parking available just outside the theatre, as well as a changing table inside so mommy and daddy don’t miss anything if your child needs a change! What a great concept for new parents and parents in general. Babies cry and toddlers squeal, but no one seems to mind. 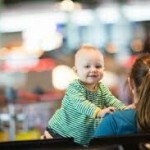 This is definitely something to look into if you have cabin fever and need to get out with baby. Bravo, movie theatres. Bravo! There are many yoga studios that offer pre and post natal classes. Prenatal yoga allows you to meet other moms-to-be and prepare for birth while postnatal classes accommodate your little one. Check with your nearby studio for details, as it’s also a great way to meet some other new moms. Do you love art or enjoy visiting museums like I do? Your local art museum may offer free admission or programs and classes for little ones. In my hometown, Los Angeles, for example, LACMA offers free memberships to children under 18 as well as one adult. They offer activities such as story time in the galleries. Maybe your infant isn’t old enough for classes yet, but art in general is great visual stimulation for both you and baby. Have a picnic in the grass and invite some of your yoga mommy friends! I recently got a membership for my son and I, and we can’t wait to go! Maybe the museum is not your thing but books are? Public libraries offer story time for children of all ages, and some even offer summer reading clubs for older children. Take a stroll or a drive to your local library and check out the (free) activities they have to offer. Want to give your little one a head start in the water and get some bonding time in? Consider a mommy and me swim class. 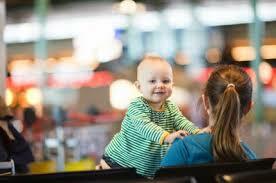 Some places start as young as 8 weeks with others having a minimum age requirement of 8 months. If this sounds like something you want to try, do a little homework on what your area has to offer and let’s get swimming! A good old fashioned trip to the park never gets old. The park in my neighborhood has swings fit for adults. On a lazy day I will sit in the swing with my baby. We both get to relax and people watch while simultaneously getting some fresh air. Maybe you made friends with some yoga moms or met some mommys on a Facebook group page, at swim class, or even standing in line at the market. (I met a fellow mom walking home from the park and found out our sons were weeks apart and we both were in the same industry!) Either way, take turns hosting playdates at your place or at the park – it’s a great way for both of you to get out and be sociable. Farmer’s Markets are great for more than just organic and fresh produce. 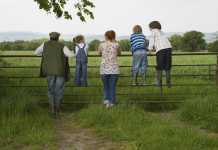 Your infant may be too little to do much of anything, but the fresh air, the colors and smells they will experience as you walk from booth to booth are worth a visit. I love the smell of the flowers, the fresh coffee brewing, the homemade candles…and I love that my son is being exposed to them. Kids running around, faces being painted, and the buzz – all great stimulation for my baby. On days where I have no specific errands to run, no particular place to be at any time, and no desire to do much of anything, I like to go for a drive. Let’s face it, you’re exhausted and baby needs entertainment because watching the Disney channel is becoming redundant and you can only read so many books to your baby who may or may not be interested. I’ll pick a baby-friendly station on Pandora like Rockabye Baby and just drive. With any luck your baby will nap and you will get some “alone” time. On these days I like to go through Starbucks drive thru and get a doppio con panna over ice. If today is the day you go for a drive, get a drive-thru car wash if your car could use one! I’ve also sat in parking lots while my little one sleeps, so always carry reading materials in your car! Maybe today you don’t feel like going anywhere. Maybe you don’t feel like going for a walk or going to the park. Perhaps you are looking for activities to do around the house? Today you just want to be home. Break up your day into learning segments. Your infant is probably still napping every 2 to 3 hours, so plan around nap time accordingly. In the morning I like to put on Mickey Mouse Clubhouse,and we sit together and watch Mickey and friends. He is mesmerized by the colors and sounds and the fun songs(admittedly, I know all the words, but don’t tell anybody). I will then turn off the TV and put him on his activity mat. We do tummy time, bicycle stretches, and even music time with his Fisher Price xylophone. I like to sit on the balcony in the late afternoon and describe everything I see. If I have the energy to cook or clean, I will tell him what I’m doing step by step. Bath time is an integral part of his nighttime routine. Followed by 3 books that he “chooses.” And by “chooses,” I mean books he happens to look at or try and grab! These books are usually by Dr. Seuss. Find what works for you and baby, and you will never be bored. Over to you! What fun activities do you enjoy with your baby? Let us know in comments below. Did you enjoy this article? Sign up for our free newsletter, find us on facebook, Twitter, Instagram and Pinterest.